Harnessing sustainable energy might be smart, but it’s not always pretty. One company, Chetwood and Associates, plans to change the stereotype by designing and implementing one of the most extraordinary energy devices ever seen; the “wind dam” of Lake Ladoga in North-West Russia. Chetwood just applied for planning on the project. 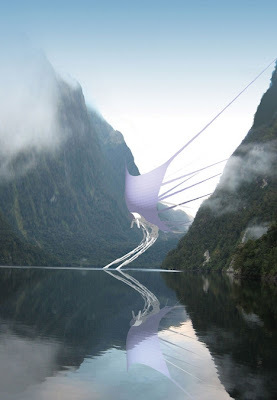 The multi million dollar dam would be situated over a gorge and would capture wind in a cup shaped spinnaker sail, that would then generate renewable energy by funneling it into an attached turbine. The project architect, Laurie Chetwood, said that was intended to have a sculptural quality. “The sail looks like a bird dipping its beak in water, which will be much less a blot on this beautiful and unblemished landscape.” Chetwood said. 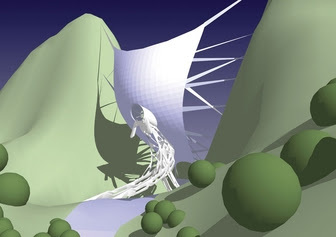 Based on these incredible renderings, we believe they accomplished their goal and give them a tip of the hat for honoring the majesty of the natural environment, while developing a functionally and aesthetically impressive creation. If granted planning, the dam will be 25m high and boast a 75m span when it goes on site next year. The practice is also looking at applying for planning permission for a similar scheme at another gorge, further up the valley.